Old Mumbles is a lighthouse near the Mumbles Rocks in Swansea Bay, South Wales. It was built in 1794 and lit by two coal-burning fires, to warn ships of the danger. If you get the taste for paper ship building, this is a good site to visit. There are a few free downloads, and the quality is very good. 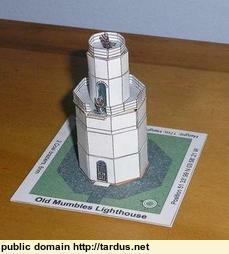 The scale makes them quite small (Old Mumbles is only 6cm high; the model that is ;-0), so you need good eyesight, or a good magnifier. I've ordered the latter. There is a very good model of HMVS Cerberus, the first warship to be solely powered by steam. It was built for the defence of Port Phillip Bay, in Victoria, Australia and arrived there in 1871, staying there until it was scuttled as an artificial reef in 1926. Maybe I'll try building this one (but not until that magnifier arrives - my left eye is now 58 years old, and the right one not much use, though it is the same age).